Won't Be A Ghost engages the history of radical sexologist Magnus Hirschfeld and his Weimar-era Berlin Institute of Sexology, braiding it together with the story of trans-hacktivist Chelsea Manning, the lore of St. Sebastian, and the Greek tragedy Agamemnon. By interrelating these histories and myths, Won't Be a Ghost examines the truth-telling body, specifically the queer/outsider body, encountering and in conflict with the state. 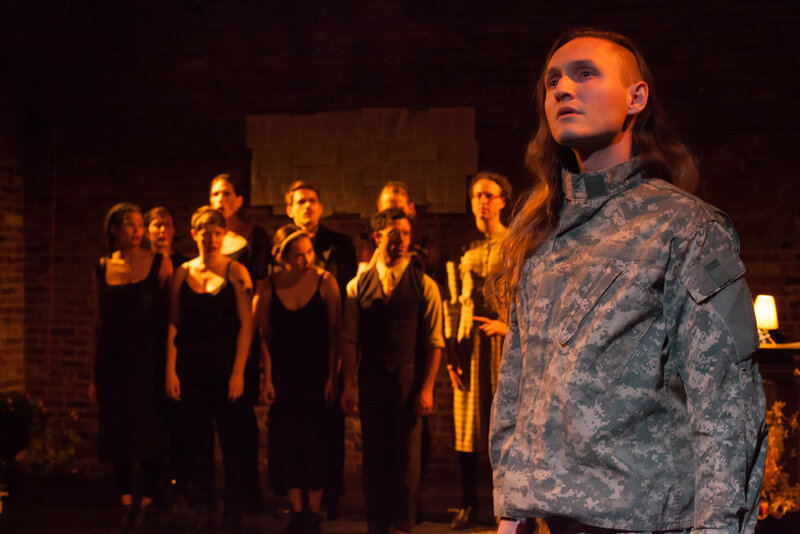 A chorus, led by composer Leslie Allison, draws on Brechtian and Greek tragic traditions to help navigate this rich emotional-political territory. Choreography by Laurel Atwell. Earlier work-in-progress showings of Won’t Be A Ghost have been presented at Prelude ’14, The Drama League of New York, HERE, and through a residency at Dixon Place. The 2015 Kilroy List recognized Won’t Be a Ghost as an Honorable Mention. Won't Be a Ghost premiered at The Brick Theater in April 2016.